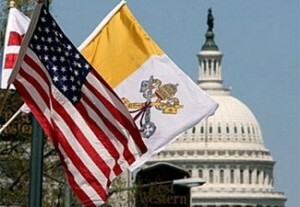 Catholics Witnesses in the Public Square (CWPS) has released the 10-minute video in union with the U.S. bishop’s Fortnight for Freedom– two-weeks of prayer and action to defend our religious liberty. “The government wants to limit our expression of Christianity by telling us we can’t take our faith into the public square,” says Adriana Gonzalez, co-founder and vice president of Catholic Witnesses. She states that never before in the history of our country has the government attempted to trample our Constitutional rights in this way, so all Americans, regardless of their faith, should be concerned. The video features four Christian leaders that explain what is at risk. “Freedom of religion is extremely important to America because if we are going to remain moral, we must be free to speak our faith in the public square,” says Fr. Michael Orsi, Chaplain & Research Fellow in Law and Religion at Ave Maria Law School. He says that religion is not just for Sundays but something that permeates every aspect of our lives. “We cannot be fully Church and be fully followers and believers in Christ if the way we love the Lord is subject to government regulation,” explains Gloria Purvis, TV host, speaker and evangelist.